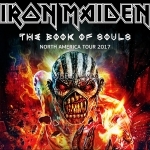 IRON MAIDEN’s hugely successful The Book Of Souls World Tour is coming to Pinnacle Bank Arena. The mammoth tour opened in Florida last February playing fourteen sold-out shows in the U.S.A and Canada along with a further 58 concerts in 34 other countries around the globe. First night reviews from Ft Lauderdale called it “…a full-throttle, devil-may-care performance that thrilled a sold-out BB&T Center” (Sun Sentinel) with Revolver magazine reporting how the band’s legendary mascot Eddie dominated the Maya-themed stage: “From a walking zombie towering over band members during the set, to being featured on a host of back-drops and huge blow-up figures – the quintessential symbol was omnipresent for the entire show” including Eddie having his heart literally ripped out of his chest and hurled into the crowd by singer Bruce Dickinson!